Industrial robots that do welding and metal fabrication are getting both a lot smaller and a lot larger, depending on the size of the company using them and the type of welding configurations they need. ABB helped make this clear in their recent demonstrations at this year’s FABTECH 2011 show, from November 14 through November 17 at McCormick Place in Chicago. The company’s demos highlighted the wide range of emerging robotics welding and fabrication technologies available. Systems ranged from highly engineered, complex configurations for heavy, large-frame welding to small, entry-level packages. 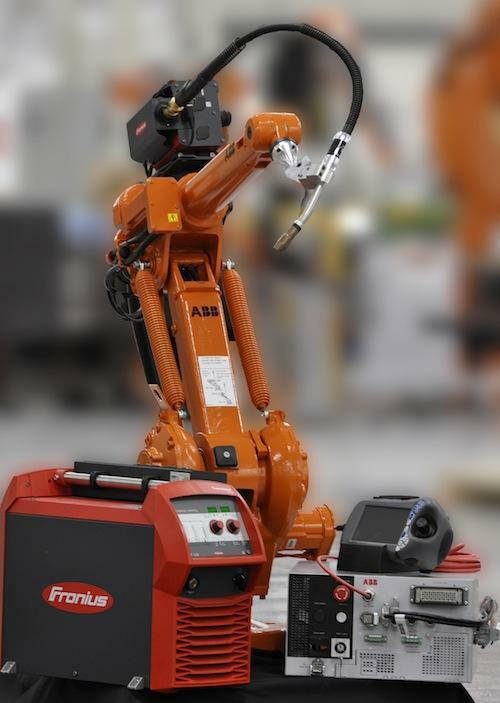 “In general, more companies at both ends of the size spectrum are moving into the virtual world of robots,” said Mark Oxlade, welding segment manager for ABB Robotics North America. One demo was a 10-axis welding titan consisting of an IRB 140 robot with welding gear attached to the arm of a larger IRB 660 robot to increase reach, accessibility, and cycle time. ABB developed this configuration in Europe during the past year, and introduced it to the North American market at FABTECH. The system provides an economical alternative to a robot traveling on a traditional gantry column. It also has a smaller footprint and a longer reach. Perhaps most important, it provides much better cycle times by making it possible to work from a fixed position sequentially in four different welding quadrants. At the other end of the size spectrum, another demo showed the company’s recently introduced ArcPack Lean 1410, a fully configured, quick-start robotic welding package that is simple enough to be sold off the shelf in catalogs. The base package of this model is available for less than $35,000, said Oxlade. That includes an IRB 1410 robot, the new IRC5 Compact controller, a power supply and wire feeder, and a 500 amp air cooled welding torch. All the user needs to add are tools and guarding. In the past, engineers in many smaller companies that are potential users of industrial welding robots assumed that millions of parts were necessary to justify getting only a single robot. But that has changed. “For one thing, controller software for the PC such as our RobotStudio is getting more capable and easier to program,” said Oxlade. “It’s aimed at non-programmers as well as programmers, with a point-and-click interface option.” The problem that software like this helps to solve is how to do smaller volumes and high diversity easily, accurately, efficiently, and quickly. Industrial welding and metal fabrication robots are being developed specifically for smaller shops and factories, such as companies making switch gears and electrical boxes. With the ArcPack Lean 1410, ABB’s intention was to extend the flexout range — the range of standard cells for arc welding — into entry-level base equipment, said Oxlade.